I imagine this will be used purely for decoration- he got a shadow box for it so he could display it prominently. if ever used as bottle opener, would be awkward to handle. Very classy like; well constructed and useable as well. Recipient was surprised to learn that you could use this as well as show it off. Purchased 2 of these, one for my hubby and one for my brother that are both golf nuts !! They were presented well in a nice box with certificate of authenticity. Great gift for a golf lover that's impossible to buy for. They both loved it. Sawgrass Golf Ball Bottle Opener a Big Hit! The gift recipient loved the gift! I bought this item for my husband's birthday. 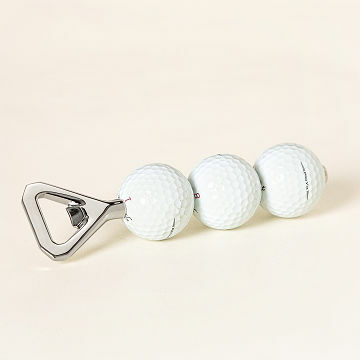 He is a golfer and absolutely loved the bottle opener and loved the fact that it was made from reclaimed golf balls from Sawgrass (his favorite course to play when we are on the East Coast). He makes a point to show it to all his golf buddies when they are visiting. My suggestion would be that you also add a bottle opener made from reclaimed balls from the Master's in Augusta and other big venues. My husband actually said this was the most unique gift he's ever gotten! The packaging is very nice and the product itself is stylish and durable. Although I bought this for use in my husband's man cave; It has spent it's time in our home on our coffee table as a conversation piece! This was a Christmas gift for my son, who is a golfer and he really liked it. Great gift!